Our nano-kitchen is no longer a bread virgin! 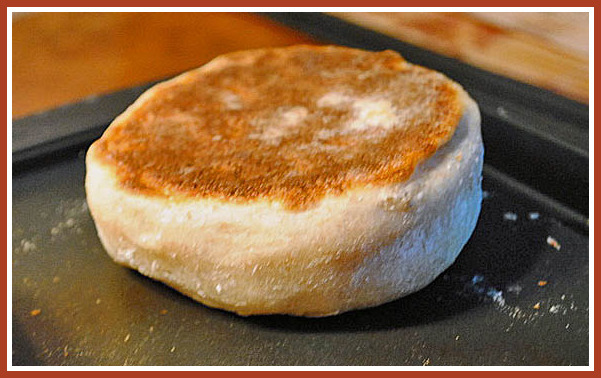 This morning I baked a batch of English muffins, my favorite breakfast item. I used a recipe found in Susan’s Wild Yeast blog, that calls for a mixture of whole wheat and regular flours, and baked them on our electric griddle. It was wonderful to feel the smell of freshly baked bread in our new home. Combine all the ingredients for the sponge in a medium bowl, cover and keep at room temperature for 8 to 12 hours. Add the dough ingredients and mix to combine. Let the mixture sit for 10 minutes, then knead by gently folding a few times in the bowl. Cover and repeat this minimal kneading two more times over a 45 minute period. Do not add more flour, it will be a little sticky, but with time it will gain body and be easier to handle. Flour the counter, pat the dough gently over it, cut in 8 pieces and form each one very gently into a flat circle. Place them over a floured parchment paper (dusted with semolina flour or cornmeal if you like), sprinkle flour on top and cover. Allow them to rise for 1 hour. Cook them on a very hot griddle (450F) slightly coated with oil. Cook them 7-8 minutes per side, but make sure to flip them in the beginning every 2 minutes, this will ensure nicely shaped muffins. Cool completely before splitting them (preferably using a fork). Comments: I’ve been on a quest for the perfect sourdough / whole wheat muffin, and tried 4 different recipes in the past few weeks. My only change to Susan’s recipe was modify it for minimal kneading, and slightly increase the proofing time. I tried it with a higher proportion of whole wheat in the final dough, but that compromised the texture. This variation gave me the best crumb and still a hearty taste from the whole wheat flour. « GRATING TOMATOES (AND LOVING IT)! Hooray! Making bread again! 🙂 I’ve never had much luck with sourdough muffins, will have to revisit…thanks Sally! Sally, looks great! I used to live in LA and had a nano kitchen. If fact, mine made yours look big. I could literally stand in one place and pivot to reach everything in the kitchen — sink, counters, cupboards, stove, and fridge! I saw these yesterday while I was visiting, and so put a batch together last evening. Made them up this AM, and they came out quite well – I loved how light and airy the dough was this morning. My only issue was one I created – I used a cast iron griddle, which seems to get hotter as one uses it – but it may be the stove instead. It’s always something, isn’t it? Nice muffins all the same. Too many variables with bread baking, but that’s what makes it so much fun, and so rewarding when we hit that elusive jackpot! An old post for you but one I only came across recently. Thank you for the recipe. Made with success! Thanks for the feedback! glad it worked for you! Once they are split, you toast them in a toaster? Can you pl guide me how to make sour dough starter.. i bake regular bread with yeast.. thanks for your guidance..